During my time at university, I came across a lot of opportunities that are available to students to get involved with, outside their degree programme. I would like to highlight some of these opportunities and highly encourage other students to take part and get involved. Through these opportunities, I have been immensely benefited and I would like to share my experience. 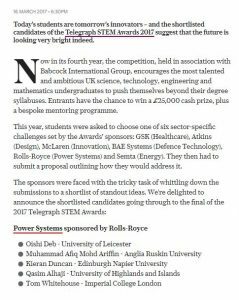 The Telegraph STEM Award is a national competition which offers students with a unique opportunity to share their ideas. The STEM award has six different categories and each category are sponsored by leading companies. Each category challenge is set by the industry experts and ask students to submit their innovative ideas. 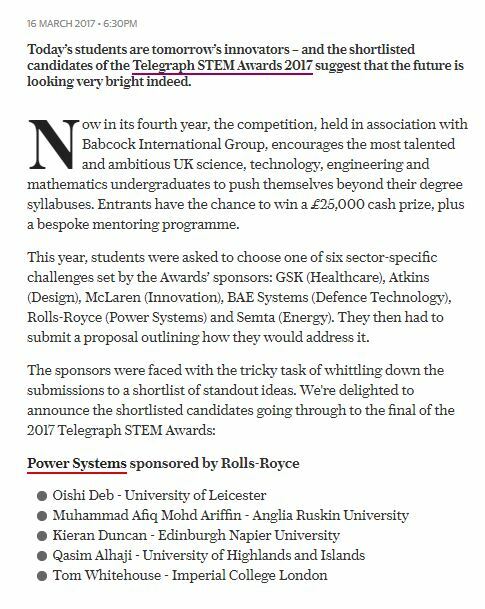 In 2017, I took part in the Power System Category which was sponsored by Rolls Royce. 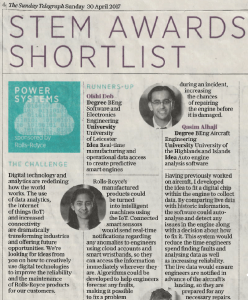 It was an amazing experience and was really thrilled to be one of the runners-up in this category. 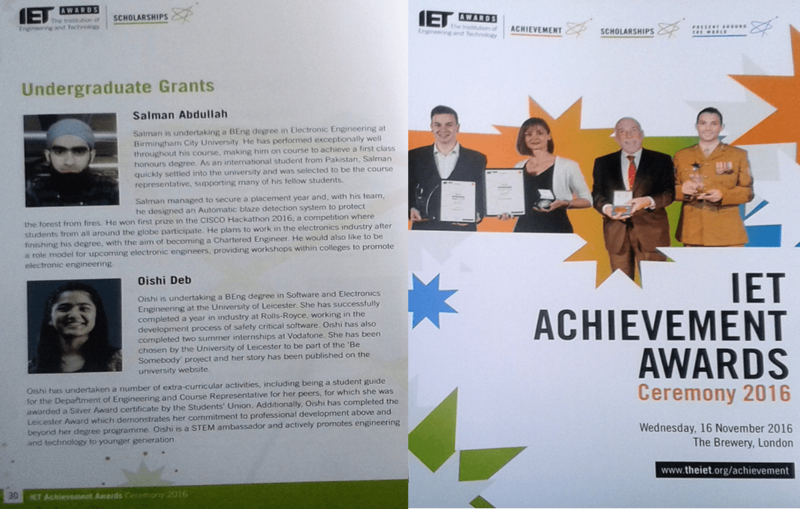 The IET ( Institution of Engineering and Technology) is a leading institution which provides several opportunities to students from awards, scholarships to competitions. According to IET website, the IET is one of the world’s largest engineering institutions and most multidisciplinary. There are several scholarships available for the undergraduate to graduate students. It also offers ‘Present Around The World (PATW)’ global competition for students and young professionals withing engineering to showcase their presentation skills. I was really pleased to receive one of the IET undergraduate grant award in 2016. 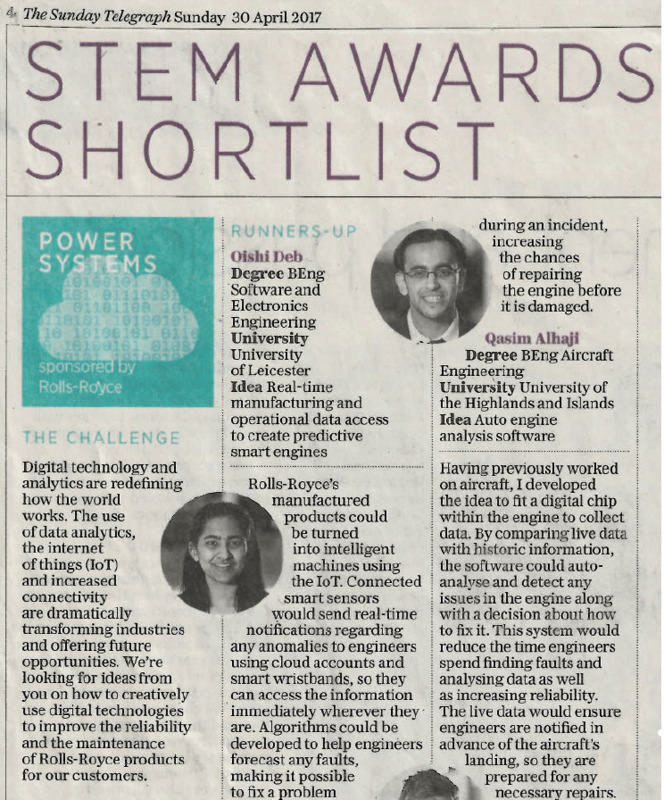 Last year, pleased to receive a @IETawards Undergraduate Grant 2016 @LeicesterAlumni. I would like to mention about the UKNEST scholarship which is offered by the UK Naval Engineering Science and Technology (UKNEST) organisation. This scholarship scheme also provides mentoring from professionals and graduate buddies. 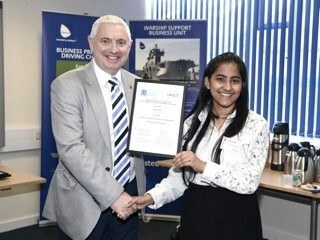 The scholars get an opportunity to visit a naval base, as the prize ceremony takes place there.